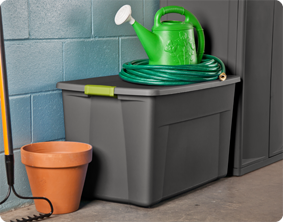 Keep your space organized with the versatile 35 Gallon Latch Tote. This tote is the perfect size for blankets, sleeping bags, seasonal clothing, sporting gear, and other bigger, bulkier items around the home, and the opaque base allows contents to be out of sight. Durable construction makes this an ideal solution for storage needs in the garage, basement or attic. 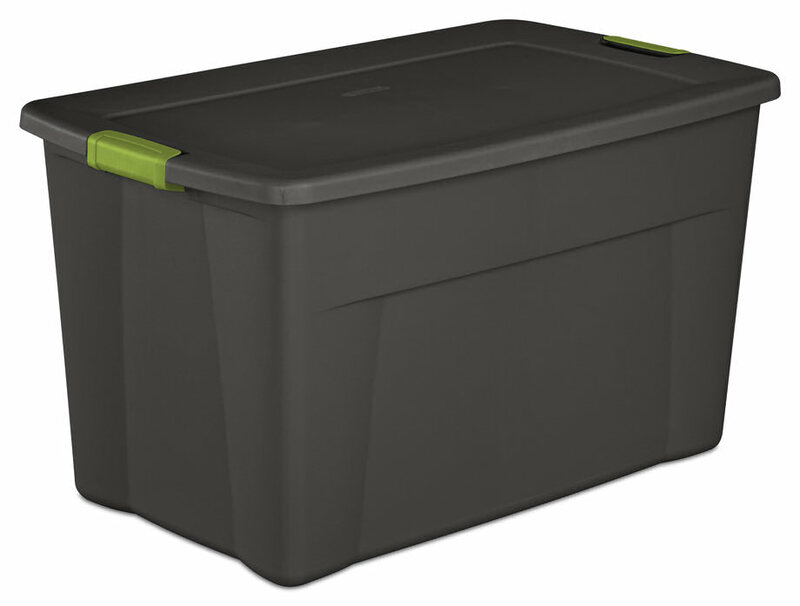 Indexed lids allow multiple totes to stack neatly on top of each other for efficient use of vertical storage space. Contoured end panels and robust latches make for a sure and comfortable grip when carrying. 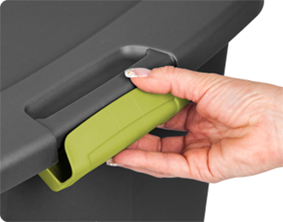 The latches also offer extra security that the lid will stay attached to the base, and contents in place. The overall dimensions of this item are 32 1/2" x 19 3/4" x 18 5/8". 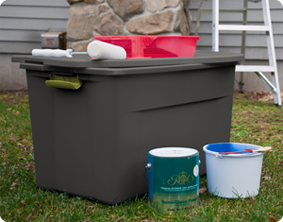 Overall Assembled Size: 32 1/2" x 19 3/4" x 18 5/8"
Paint supplies can be organized in this latching tote so they are easily found and ready for your next paint job. Latches keep items safely stored inside. 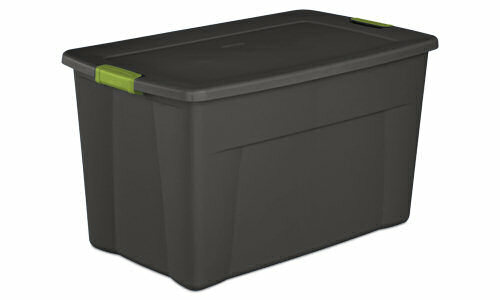 Ideal for storage of larger items such as outdoor seasonal items, gardening supplies and more in a garage or basement. 35 Gallon Latch Tote is rated 4.7 out of 5 by 3. Rated 5 out of 5 by Jessica D from Great for clothing storage Admittedly, my 3 year old has an over abundance of clothes. These are great for storing her clothes to be stored in the basement, whether they are too small, or out of season. They are easy to carry and really durable! Rated 4 out of 5 by wfay from This product has 1 easily fixed lid problem The lid on the latch tote is not heavy enough on the latching ends. Many lids I found in the stores were torn at the latching end preventing the tote from actually latching. The plastic is too thin in that area of the lids. If it were doubled in thickness there, the lid would not be so prone to tear. I had one tear on me at home. This was due to the top of the inside of the tote having a pillow or other compressible item which the lid should easily have held down. The tote latched fine and then the lid tore. Rated 5 out of 5 by coyote1 from Great bang for the buck! Very useful size! Good size, reasonably strong yet lightweight. I like the 35 gallon better than the 45 gallon size. great value for price. Can stack when full as long as weight not to great. Not UV resistant! I have found them to be raintight, however they will fall apart after about a year in the sun.